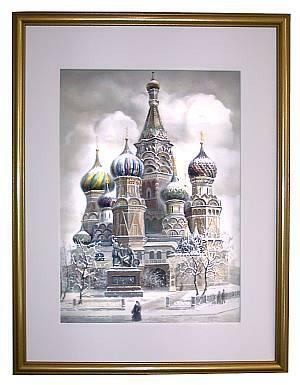 Tradestone Gallery and Lacquerbox.com present their fourth in a series of high quality giclee prints, all taken from the artwork of notable Russian lacquer boxes. This print comes from the painting on a breathtaking box which was done by Fedoskino artist Andrej Borisov. It shows one of Moscow's most famous and recognizable landmarks, St. Basil's Cathedral. While the box is no longer available, the print of it is. Whether you have seen St. Basil's in person or not, we are sure that you will enjoy the beauty, spirit, and majesty of its architecture as depicted here. The print measures 12 inches by 17 inches and fits perfectly on an 16" x 20" frame.